Structure My Deal tools are complete — you're ready to visit Nissan of McKinney! 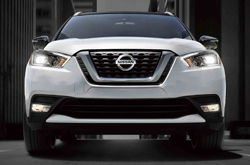 The 2019 model year marks the second model year for the Kicks, which is the Nissan subcompact crossover in the North American market. Still very fresh in the automotive landscape, this model does not have any updates from the debut year. What are the Trims and Features Available on the 2019 Kicks? The 2019 Nissan Kicks is available as an S, SV, and SR trim. Serving as the base-level trim, the S provides standard comfort and convenience features such as cruise control, auto multi-reflector halogen lights, remote keyless entry, roof rails, Bluetooth wireless technology for hands-free phone operation and audio streaming, power outside mirrors, push-button engine ignition, six-speaker audio, a 7-inch touchscreen, AM/FM radio, and three USB ports for connecting up portable media devices. 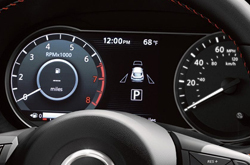 At the SV trim level, Nissan upgrades the Kicks with features such as automatic climate control, outside mirror heating, a smart key system, remote engine start, NissanConnect for infotainment integration, Apple CarPlay and Android Auto for smartphone-based control, and a three-month trial subscription to SiriusXM radio. The SR is the top-level trim, as well as the sport-oriented one. Not surprisingly, it comes with a sports-style cloth seat trim with orange accents and stitching and a rear roof spoiler. Also exclusive to the trim are turn-signal indicators on the outside mirrors, a leather-wrapped steering wheel and shift knob, and LED signature accents on the headlights. 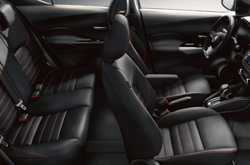 The 2019 Nissan Kicks supplies two rows to seat up to five people, with passenger space measured at 93.9 cubic feet. Also standard cargo space is set at 25.3 cubic feet, the rear seats fold down to optimize the cargo space at 32.3 cubic feet. The 2019 Nissan Kicks is powered by a 1.6-liter 4-cylinder engine, which supplies 122 horsepower and 114 lb-ft of torque. 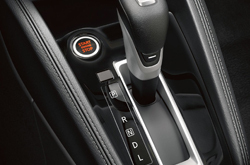 A continuously variable transmission is paired with the engine for a smooth driving feel due to the absence of a gear-shifting mechanism. Thanks to its front-engine, front-wheel-drive layout, the Nissan Kicks provides a fuel economy of 31 mpg in the city and 36 mpg on the highway. What Safety Features Come on the Nissan Kicks? For restraint and cushioning in the event of a crash, the 2019 Nissan Kicks provides a driver's knee airbag, a pair of front impact airbags, dual front seat-mounted side impact airbags, and a pair of roof-mounted side curtain airbags. Also standard on this subcompact vehicle are a rearview camera, vehicle dynamic control, automatic emergency braking, traction control, hill start assist, and a theft-deterrent system. At the SV trim level, Nissan adds a blind spot warning system to detect other vehicles located to the driver's side and rear; and rear cross-traffic alert to avoid colliding with objects or other vehicles when backing out of the garage into the street. On the SR, the rearview camera is replaced with a camera that provides an around-view perspective. Also added on the SR are fog lights for penetrating illumination: ideal for fog, rain, snow, and the dark. Come check out the 2019 Nissan Kicks at our dealership in McKinney, TX today! *Get Today's Price is available to all customers and can also be obtained by calling or coming into the dealership today. Purchase prices do not include tax, title, license and $150.00 doc fee. Prices include the listed rebates and incentives. Please verify all information. We are not responsible for typographical, technical, or misprint errors. Inventory is subject to prior sale. Contact us via phone or email for more details. *MPG Based on 2019 EPA mileage ratings. Use for comparison purposes only. Your mileage will vary depending on driving conditions, how you drive and maintain your vehicle, battery-pack age/condition, and other factors.